The title is not an excuse for not posting for a while (hadn't got anything to say!) but more a description of the local badger activity over the past week or so. 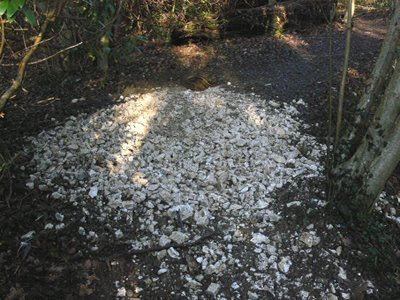 About five years ago, badgers established a new sett close to houses in Banstead, it was a modest three-entrance abode set amongst scrub that involved digging into the chalk and the associated earthworks were quite something. For a couple of years nothing changed and then an extra entrance was provided. Evidence of their everyday activities was obvious with many tracks strewn with bedding material leading to the sett. Now and again when I walked the dog in the morning I would be lucky enough to get a fleeting glance of one of the occupants. During the recent snow there was not much activity and they didn't start changing bedding for almost a week after it had cleared, presumably when the dead grass and moss that they use had dried out. Then last week they got the builders in, so far two new entrances have been created and two more have been started. Amazingly one of the new ones (see photo) is right in the middle of a path used regularly by dog walkers but they (the badgers) have not let that deter them they are still putting the finishing touches to it and walkers will have to detour. Presumably the family group is growing and they need extra space, quite a lot judging by the chalk they are shifting.